I liked Damien Demolder’s article today on dpreview about whether Canon is taking the mirrorless market seriously or not. Very good piece. But I don’t think it goes far enough. For reference, the size of the film SLR market was a bit more than 4m units at the time. Today, the ILC market stands at almost 14m units. 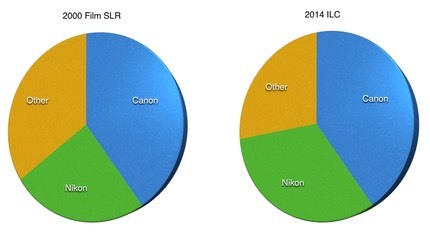 Most of “Other” in the 2014 chart is mirrorless, by the way. The size of the market for interchangeable lens cameras grew 5x and now has shrunk back to closer to 4x. Still, if you wanted to be in the market in 2000, you’d want to be in the market in 2014, right? Which explains why we still have all the same players involved (though some with different owners). Canon’s share, with a few wobbles, has stayed relatively the same overall, probably within a +/- 5% range. Thus Canon fully enjoyed the ride from 1x to 5x. Nikon’s share actually grew in the DSLR era by a significant 30%, partly because they were a first and aggressive mover. Thus, they enjoyed the growth in the market more than Canon did. One question that keeps getting asked is just how fast do Canon and Nikon need to move into mirrorless? dpreview’s article asks “is [Canon] finally taking mirrorless seriously?” Well, do they have to? Not as much as people think. At the moment, the two big ILC companies, Canon and Nikon, are simply rising and falling with the water level. If they switched (and could switch) all of their DSLRs into mirrorless cameras its somewhat unlikely to provide them with an upside in terms of sales. The primary upside to them would be the one that Sony is currently enjoying: lower costs in producing the product (though Sony is giving a lot of that back by being aggressive in pricing). So the Canikon hesitation towards mirrorless is explainable. At least right now. If DSLR sales keep slipping and mirrorless sales stay the same (the case of the last two years), then the pie chart on the right starts getting a bigger Other category, and that would provoke the two big companies to move. However, I think that both companies think a bit like I do: they believe that it will take something disruptive to restart growth in camera sales. The difference between me and them is this: I think I know what that disruption is and they don’t. Moreover, if I’m right about what the disruption needs to be, both Canon and Nikon are poorly equipped to create it, as it will mostly differences in software, not hardware, that define future cameras from present ones. If we’re just going to get iteration of present camera designs, ILC sales will continue to slide downwards, and at some point both Canon and Nikon will have to shift some, if not all, DSLRs to mirrorless to stay competitive. 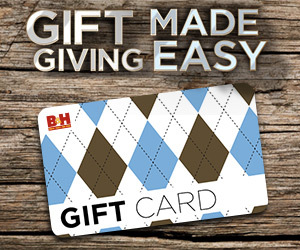 You can’t have upstart competitors that have cost of goods advantages. Eventually your volume pricing leverage erodes enough so that you can’t sustain lower DSLR prices compared to mirrorless. If we do get someone moving first and aggressively into what I’ll call the “future ILC camera,” they’re highly likely to get the first mover bump that Nikon got with the D1 and subsequent DSLRs. Conversely, Nikon is the most exposed to losing share in such a change if they don’t respond quickly. I suspect that Nikon thought that the Nikon 1 was a first and aggressive move. It might have been had it been (a) priced right, (b) had the right UI, and (c) been better connected to the Internet and/or mobile devices. Based upon my conversations with a few camera company executives recently, I think they all see that something has to change, they just don’t know what that something is. Or perhaps they don’t trust that the something they think they see is worth betting their companies on. So we’re mired in a sluggish world of incremental iterations at the moment.